Sorry Impy, I voted Solaris too. WE DIDN'T GET A SOLARIS KNIGHT FIGURE. And it's not our fault that Bandai just randomly decided to skip the figure entirely. The Quantum, NS and DT inclusions are way too random, and nobody gives a crap about Sam, really. 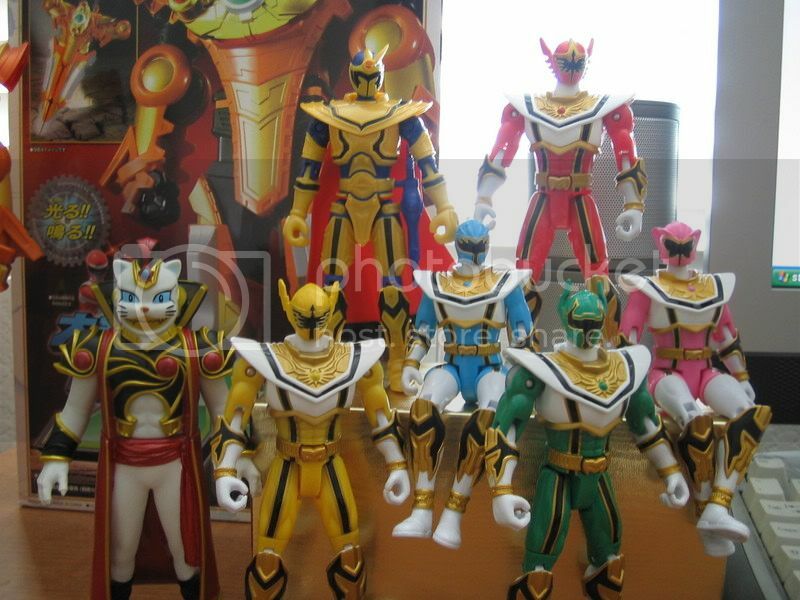 And if they're gonna give us MMPR pink, then they can damn well give us Red, Blue, Yellow and Black, too. It'd be cool to see the White MF figure with her staff too. As much as I would like to see a Zeo red, I have to go with MMPR pink. Very interesting indeed. Pink will be getting my vote because I would just love to have a decent looking figure, not to mention the possible options it could open in the future. Solaris is a close second because of the obvious reasons. My third choice would be Zeo, and the rest just don't interest me at all since they received nice releases during their time. DT Blue is just so random too... If they needed one from DT they could have at least chosen White or Black, lol. Remember everyone, Toyfare just came out in comic stores today. It doesn't hit general newsstands for another two weeks so we may or may not have to wait that long for the official poll. But I do agree with your message. No matter what everyone wants to see everyone better damned sure vote. If the numbers for this poll are insanely low then that's also a vote of no confidence about an entire retro line. Damn straight. I'll vote for MMPR Pink as soon as I have good faith that the rest of her team is coming out. What's the point of a Pink Ranger who doesn't have the same body sculpt as the Green and White Ranger? Who do you put her with that doesn't look awkward as hell? What's the point of a Pink Ranger who doesn't have the same body sculpt as the Green and White Ranger? Who do you put her with that doesn't look awkward as hell? Yeah...but unless BoA hasn't already got rid of the Sound Fury (or even the atrocious Jungle Master) figure molds by now - which they likely have - then there's no way that the remaining MMPR figures would ever have the same sculpt as Green and White. Which is the reasoning I have behind voting for Solaris and NOT for Kimberly. Yes, the RPM molds are shorter than the MF ones. Like I had said before, if the Japanese version Magishine that came with Skarpet is pretty short compared to the other Magi/MF figures, then an RPM-mold Solaris Knight would fit right in. Not to mention it'd probably be about the same size as the original BoJ Magishine. I voted for pink. And I don't really care about her having RPM mold instead of JF. After all, Kimberly was WAY shorter than Tommy anyway. oh how awesome would be to get a Pink SL figure? Same here. None of the figures are going to match up perfectly with their respective teams anyway. The Titanium and Samurai Rangers coming out are probaby shorter than the Light up figs from LR and NS. ^I agree.. the Magiranger stuff are especially cheap nowadays. I wouldn't go that far. The Dino Thunder figures lacked the ball joint arms that Bandai started using in SPD, not to mention they had no wrist articulation which I happen to consider a pretty essential joint. A Dino Thunder Blue Ranger could also easily be customized into a Dino Thunder Red or Black with a new paint job and the head of a crappy bike figure. The DT figs had really nice sculpts, paint details and comes with silver painted weapons. I'm not bothered by the lack of a couple articulations here and there. If anything, they should focus more on MMPR - Turbo. I'd like to see more villain figs as well. Last edited by ChungieBoy; March 11th, 2009 at 06:26 PM. Not where I live. I found WAY more Green and Zedd's than I did White or Gold. I actually had trouble finding White and Gold. seriously i find more white and golds than green and zedds.but guess it does depend on where you livve.but should have put more older series than the newer ones. Zeo Ranger 5 is an aboslute must for the next SL release. I don't see Bandai releasing a SL MMPR set. If they release one SL MMPR figure per toy-season then they can milk it out much longer and make a better profit. I can see Bandai giving us the whole MMPR team, but not all at once. What the heck is this "mouse master accessories" they speak of on the bandai site in the description of Titantium and Samurai Green?